Complete your romantic evening together with our tasty chocolate body paint, the perfect ingredient to your romantic celebrations. 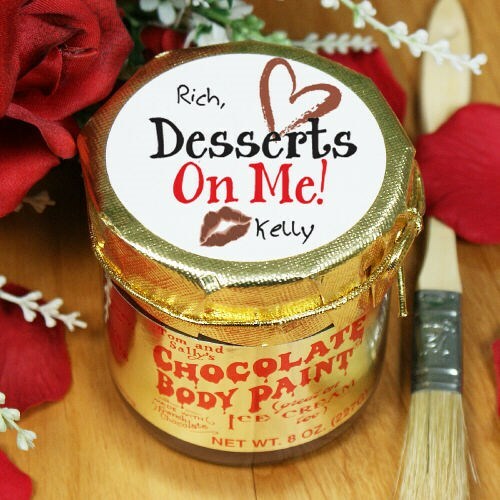 Personalized Chocolate Body Paint adds fun, excitement and romance with its delicious taste and creates a wonderful way to add a little spice to your evenings. Make this one Valentine's Day gift that your love won't soon forget. Chocolate Body Paint is Fabulous chocolate sauce made with a cream base flavored with French dark chocolate. Comes with brush for easy application. We personalize the top gold foil lid with any couples names. Directions: heat to 98.6 degrees, apply liberally and let your imagination run free. It's Great on Ice Cream too! Personalize your body paint with any couple's names. Additional Details Your evenings will sizzle with romance with our many Personalized Romantic Gifts. Whether you are looking to start or rekindle love, 800Bear.com has a great selection of Personalized Gifts from the heart at very attractive prices.